This is the first of three posts about my 2013 trip to Scotland, Shetland, and Norway. For me, one of life’s greatest joys is in revisiting corners of the world I have previously explored. This has always struck me as a bit of a paradox. Travel—seeking new landscapes and horizons—plays an important role in my life, but retracing my footsteps is an almost sacred undertaking. To return to a place that has a life of its own in my absence and to think over the changes in myself since my last visit is an intense journey in and of itself. 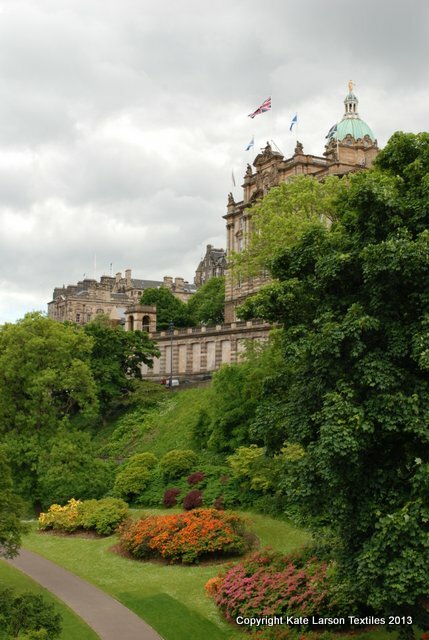 One such place for me is Edinburgh, Scotland. When I was working on my undergraduate degree at Purdue, I had the opportunity to study for a year at Lancaster University in the north of England. 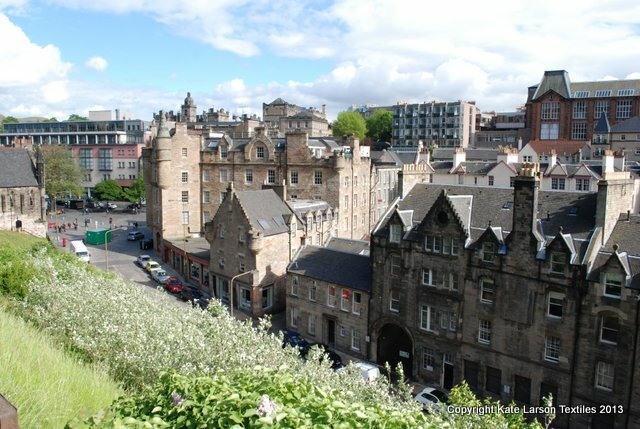 I loved taking the train up to Edinburgh on weekend trips, usually staying at Castle Rock Hostel. 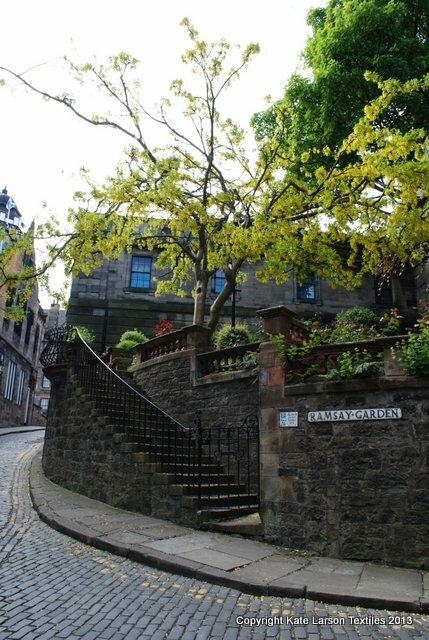 I have been back to visit Edinburgh several times since, always finding new corners to explore along with my old favourites. 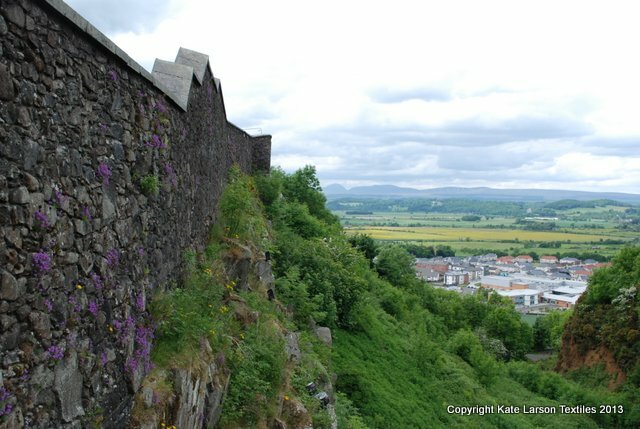 I’ve only just returned from an adventure that started in Edinburgh before heading to the Shetland Isles and Norway with my traveling friends Susan Markle and Kathy Peoples. We met up with Deb Totten once we arrived in Shetland. Traveling with fellow spinners and knitters is great. I never have to explain why visiting a woolen mill or off-the-track heritage center is of the utmost importance! 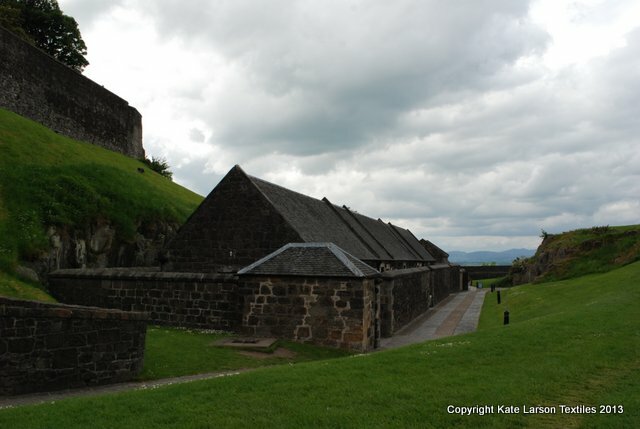 While staying in Edinburgh, we took a day to make the very easy trip to Stirling Castle. Again, this was a journey I have made a number of times before. When I was at Uni in 2000, an Historic Scotland guide mentioned to me that some of the castle apartments were due to be renovated to look as they would have during the time of James V. When I visited in 2004, the apartments were not yet open to the public, but the first of an epic series of tapestries had been completed and was on view. A tapestry studio had recently been constructed within the castle walls where weavers from the College of West Dean were working away on a new tapestry. This was about the time I was beginning to find my place in the textile world and watching the weaver sitting at the tapestry, the way that she interacted with the fabric as her fingers danced through the warp threads, made a lasting impression. She, as weaver and creator, had an intense relationship with the tapestry. And yet the tapestry would go on to have a life of its own, lasting far beyond that of its human creators. Walking from the main courtyard and out through what might have been an earlier main entrance into the castle, you can see a row of low stone buildings. At the end is the Tapestry Studio. 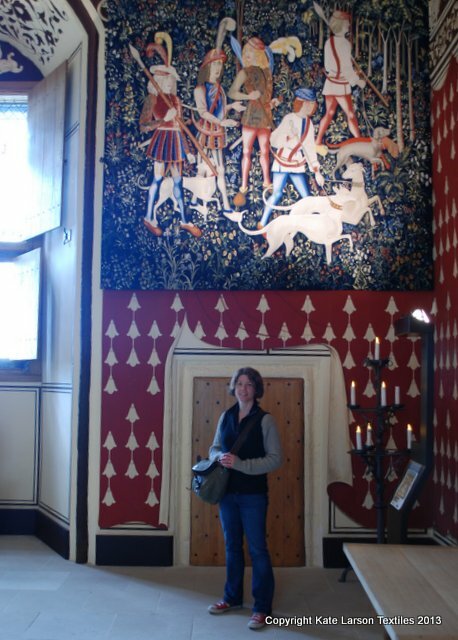 The Stirling Castle tapestry series has been an immense undertaking, taking two to four years for each of the seven works to be woven and a total budget of about £2 million. 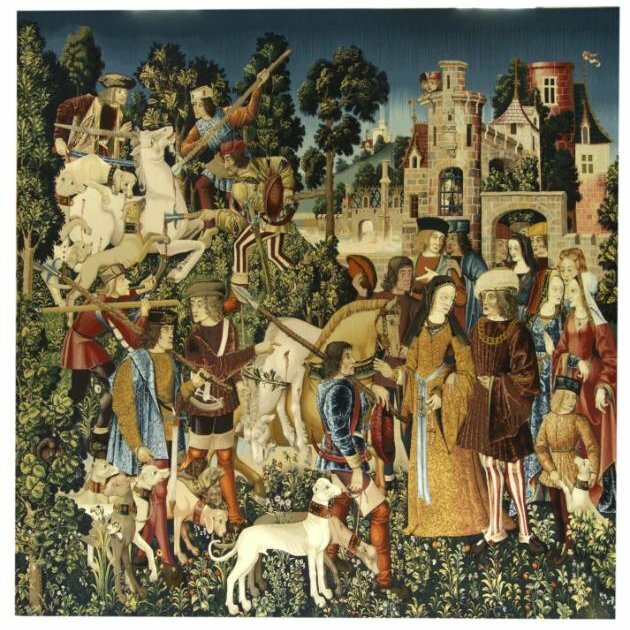 The College of West Dean in London was commissioned in 2001 to weave seven tapestries, recreating the Hunt of the Unicorn that is now in the collection of the Cloisters Museum in New York. 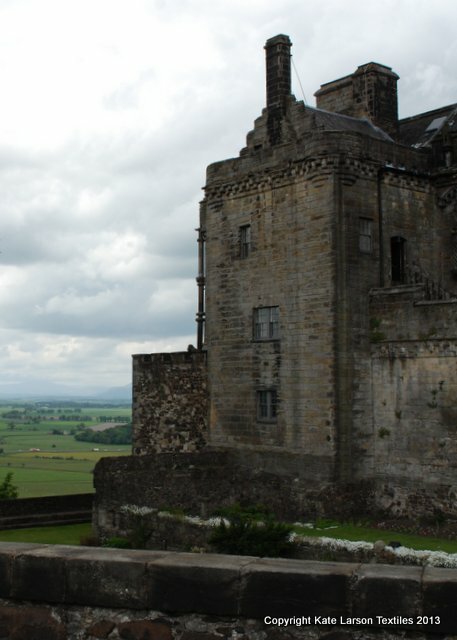 These are not the same tapestries that would have hung in the Stirling Castle apartments, but researchers are confident that the royal household owned a similar series of tapestries during this time period. The unicorn, as a symbol of Christ, was a common subject for sixteenth and seventeenth century art. To learn more about the pieces and see fantastic, mind-blowing images of the original sixteenth century tapestries, check out the online collections at the Cloisters. And then I was off to Shetland, where I met many sheep, touched many fleeces, and totally indulged myself with endless tea and biscuits… Check back for another installment next week. Posted in Adventures!, Check this out! Thank you for sharing this with us, Kate:) How lovely to live vicariously through your adventures!